Since I passing the JLPT N2 in December, I decided that instead of taking a break from tests, I would shift my focus towards studying for the JLPT N1. I’m anticipating a significant gap between the two levels, which is why I started studying in January. I know that I have to strengthen my weak points from the last test significantly. My goal is to take the test in July to see where I’m at, and then to pass it in December. Because I’m thinking about potentially leaving Japan next year, it’s essential, to me, that I make sure I to pass the test in December. I’m worried that by going home, my language skills may decrease, so I want to put myself in the best position possible to be able to get a job using those skills wherever I am. While for the N2 I used tons of books to review (more on those in another post), I’m changing my approach for the N1. I will be using books, but they won’t be as test focused. According to the JLPT website here, the goal of the N1 is “the ability to understand Japanese used in a variety of circumstances.” So my approach is going to reflect that. Not really, but every day is a must. One of my absolute weak points is vocabulary. So, my goal is to use Memrise to gain more exposure to vocabulary. I don’t expect to remember every single word I come across through Memrise, especially if it isn’t a word that I use frequently, but I at least want to have more words on my radar. I realized I’m terrible at memorizing words cold turkey. However, if I’ve seen it in the wild a few times or have seen at least part of the kanji before, my brain doesn’t mind trying to absorb the new word. So Memrise is going to be that first step. Not just books that I like, but on different topics as well. Recently I’ve been picking up business magazines, women’s magazines, books on travel, cookbooks, young adult books. I’ve also been trying to read more online. I also have the Kanzen Master N1 Reading Comprehension as well. The goal is to read often enough so that I can both improve my reading speed as well as increase the amount of time it takes my brain to get tired while reading. I speak more about this in a video here, but I’ve started using books aimed at native junior high and elementary students and it has been beneficial to my studies. It keeps things interesting while picking up words I often hear since I work in a school. Listening is my strongest skill even though I have the least confidence in it. I’m going to keep up what I’ve been doing, which is listening to TV shows/dramas/other humans every day. However, when it comes to tv and movies, I’m going to work on weaning myself off of the Japanese subtitles. Finally, I will be reviewing my grammar from N2 as well as N1 specific grammar, but focusing on being able to USE it in conversation. Honestly, while it is nice to have a general knowledge of grammar to be able to answer questions for the test, I’m personally happiest when I have a solid understanding of things. So, I will be reinforcing what I learn by using it in conversation as well as going to my town’s Japanese classes weekly on Wednesday to practice. And there you have it. This is how I intend to approach the JLPT N1. I’m not sure it is intense enough for me to be ready in 6 months, but I think I should be able to make it in time for December. Regardless, consistency is vital and I will be working on each of these things little by little until test day. 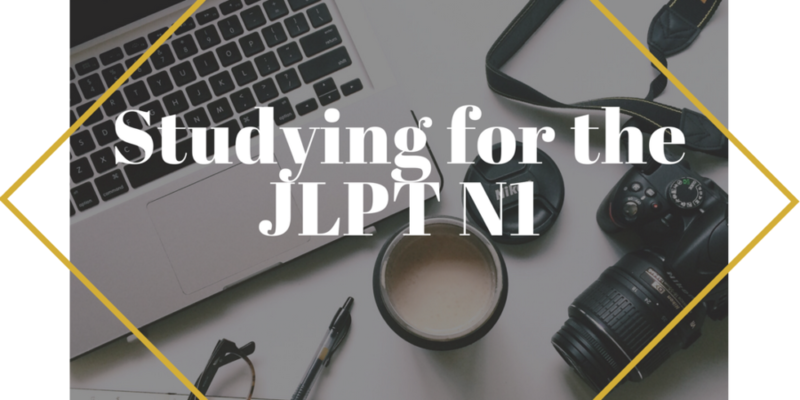 If anybody else is studying for the JLPT (any level) and has some study tips/strategy to share, please let me know in the comments! Don’t forget to follow me HERE on Instagram or HERE on Twitter to stay up to date with my Japan adventures. Do You Believe in お守り(Omamori)? Want to receive post updates or info on our favorite things to do, see, & eat in Japan? Subscribe to our newsletter so we can make it happen!